113 min. Warner Brothers. Director: Charles Martin Smith. Cast: Harry Connick Jr., Ashley Judd, Morgan Freeman, Kris Kristofferson. Does the family film Dolphin Tale pander? Well, yeah, probably. Is it a predictable falsification of fact "inspired by a true story"? You bet. So why do I feel like cutting it some slack? That's another question that's easy to answer: because, in the hands of actor-turned-director Charles Martin Smith, this kid-centric drama provides a welcome family option with positive values and a minimum of frantic, noisy CGI. It's a tale told on a human (and animal) scale. The true star of Dolphin Tale is Winter, a bottlenose dolphin who plays herself in a heavily fictionalized version of her own story. In real life, an injured Winter was discovered in a crab trap, rescued, and brought to the Clearwater Marine Aquarium, where—after losing her tail—she was fitted for an innovative prosthetic one and became a star attraction and inspiration for humans adjusting to prosthetic limbs. Screenwriters Karen Janszen and Noam Dromi integrate those basics into a fictional coming-of-age story tracking the relationship between Winter and the boy who finds him, Sawyer Nelson (Nathan Gamble of The Dark Knight). His curiosity piqued by the Clearwater rescue team, Sawyer begins biking not to school but to the aquarium, run by Dr. Clay Haskett (Harry Connick, Jr.) with the assistance of his young daughter Hazel (Cozi Zuehlsdorff). Hazel takes Sawyer under her wing and Winter takes him under her flipper as a whole new world opens up to the emotionally troubled boy. That's music to the ears of Sawyer's single mother Lorraine, who has been at wit's end trying to bring her son out of his shell and into engagement with people and his education. Dolphin Tale never goes too dark, just concerning enough for a bit of dramatic tension; more often than not, Smith applies a light touch, including the bits involving the film's best supporting pelican. School-age kids will relate to the family drama and learning struggle, as well as the interest in animal pals. 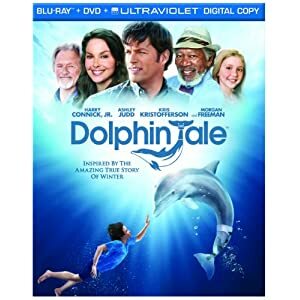 Dolphin Tale has one more ace in the hole: Smith shot the film in native 3D, so this isn't one of those cheap and dirty post-production conversion jobs. The 3D gives the movie some appealing ViewMaster pop and extra depth to its underwater photography, the better to enhance kids' fantasies of swimming with dolphins. Warner sends home Dolphin Tale in a Blu-ray + DVD + UltraViolet Digital Copy special edition that ably reproduces the theatrical experience. The image is sharp in detail and textures, with colors and contrast that accurate reflect the filmmaker's intentional post-production tweaking (for bolder color and a slightly blown-out look). The DTS-HD Master Audio 5.1 surround mix isn't the most dynamnic around, but it does make some efforts at immersion, particularly when water is around (which is much of the time). Dialogue gets proper priority, and music sounds plenty full. Bonus features lend some interesting context to the film, while throwing in a few extras from left field. One of those is "Hutash's Rainbow Bridge" (2:25, HD), a quickie animated short with a Harry Connick Jr. speech layered over it. "At Home with Winter" (13:22, HD) gets into the accomodations made for the film's dolphin star. "Spotlight on a Scene" (7:17, HD) focuses in on the film's opening sequence, from storyboards to production to CGI effects to the 3D work involved. Director Charles Martin Smith and other crew help to explain the various processes. The most important bonus feature is "Winter's Inspiration" (18:08, HD), which documents the true story that served as the kernel of the film. Also here are pig-themed computer-animated short "Ormie and the Cookie Jar" (3:59, HD), deleted scene "Winter Meets Panama" (2:20, HD) and the "Gag Reel" (2:45, HD). All site content © 2000-2019 Peter Canavese. Page generated at 04/20/2019 11:51:29PM.